“First Reformed” is one of the weirdest movies I have ever seen. It tells the story of a pastor’s quest to understanding himself and the connection between the church and the climate change. It started OK, but from the mid point on there wasn’t a scene were I wasn’t muttering to myself WTF?! And I think it all boils down to Paul Schrader’s vision, because he wrote and directed this film. I admit I am not very familiar with his work….or I know it, but I don’t attribute it to him. But from what I have seen, well, let’s just say I won’t be on the lookout for any previous or upcoming projects from him. The direction was OK, although I was distracted by some of the shooting angles he used (incomplete shots, view from the back, lateral positioning). What I definitely didn’t like was the script. Firstly, because it was a bit pretentious and philosophical (and I don’t like philosophy), although the questions he posed about religion’s connection to nature were interesting. Secondly, because it had a lot of weird moments that I didn’t understand and that didn’t make sense in the context of the movie and with had happened so far. This happened especially in the last act. The out of body scene with the two of them on top of each other. The self flagellation. The vest. The movie felt cold and analytical, especially with the lack of soundtrack, and its only saving grace was Ethan Hawke’s expressive performance. He portrayed a troubled man who gets consumed by Michael’s beliefs and start questioning life and the church’s role in it. Couple that with health problems and a drinking addiction and it all goes down. I loved his performance and it moved me. He definitely should have gotten some awards love. 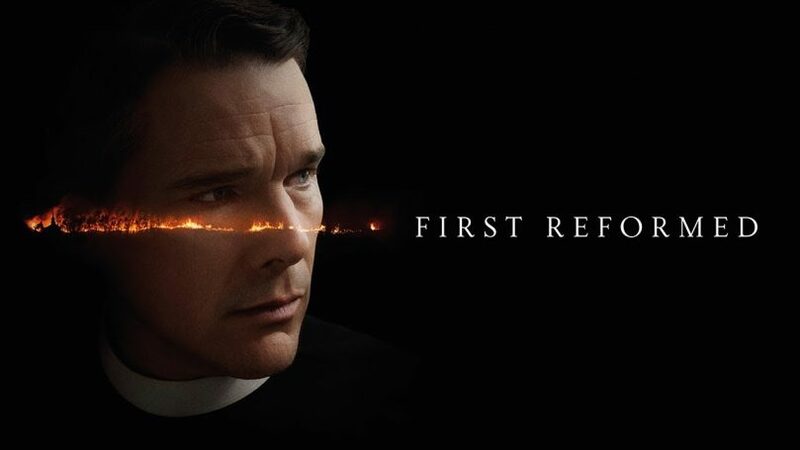 Overall, I did not enjoy “First Reformed” and I don’t recommend you watching it. Phew, I was starting to think I was alone in not liking this movie! I can appreciate the performances (which were wonderful) but my face said ‘WTF’ for most of it too. WOW I had no idea this movie deals with climate change! Hmmm I almost rented it but ended up seeing BlackkKlansman instead. Sounds like I made the right choice. Yeah, I don’t think it’s that great. I wanna see BlackkKlansman, too, hopefully soon! Thanks for dropping by!